What Else Can I Expect From an Online Bachelor's in Theology Program? A rigorous theology program prepares graduates for careers as ministers, missionaries, or educators, or to work for nonprofit organizations built on Christian principles. Theology students have traditionally studied in campus-based programs, but as online higher education opportunities expand across disciplines, online theology programs are increasingly popular. Today, thousands of distance learners pursue their spiritual and professional callings remotely. Many accredited colleges now offer comprehensive online bachelor's in theology degrees. These schools allow students to pursue degrees at their own pace -- a convenience for anyone who must work full time to pay for school or provide childcare. Online programs are usually more affordable because distance learners save on commuting and living expenses, and often pay lower tuition rates. It's important to consider that the cheapest online theology programs may not always be the best. Quality curricula from accredited, reputable schools offer far more benefits than degrees from colleges that charge low tuition rates but provide low-quality education. Fortunately, several affordable and reputable options exist for students seeking online degrees in theology. The table below can help you decide which colleges would offer the best programs at the most affordable prices. We calculate our "college affordability score" based on a comprehensive list of online universities offering attractive educational programs in theology, biblical studies, and ministry, plus financial assistance and financial aid packages. These schools boast low tuition rates and tend to help students graduate with little or no college-related debt. Located in the Los Angeles suburb of Anaheim, California, Bethesda University offers an affordable opportunity for global learners to earn a theology degree online. BU offers a bachelor’s of arts in religion with a concentration in biblical studies or Christian education. Courses review scriptural texts, systematic theology, Pentecostal theology, evangelism, and missions. Christian education electives include Christian education of youth and family ministries in the church. This four-year degree requires 126 credit hours, including 81 credits of specialized training in biblical interpretation or ministry. Online learners complete classes within the traditional academic calendar. While most coursework can be completed remotely, students apply classroom knowledge with required service hours in a ministry setting. Founded in 1932 as a Baptist Bible seminary, CSU is located outside Scranton, Pennsylvania, and offers an affordable online theology degree to prepare remote learners for careers in ministry or for advanced graduate study. The bachelor's of science in integrated studies introduces students to foundational methods of biblical interpretation. Electives include New Testament interpretation, evangelism, preaching, and philosophy. Students may begin eight-week classes in August, October, January, March, or May, and incoming students may begin their degree in any term. Full-time students typically complete the 123 required credits in four years. Offered entirely online, the program includes virtual discussions and collaborative group projects to promote student engagement. Tuition discounts are available for applicants currently serving as ministers or involved with programs such as Teen Challenge USA or Word of Life. With a 14-year history of online learning, LRU’s bachelor's of arts in religion incorporates state-of-the-art lecture videos. Students have access to the academic library, and the faculty mentors students spiritually and academically throughout their studies. All students earning an online theology degree enroll in 42 hours of biblical interpretation coursework, including advanced studies of Genesis, Psalms, or Acts of the Apostles, with a focus on apologetic methods. Students may pursue minors in biblical counseling, Christian worldview, or ministry, with concentrations in family and personal counseling, forms of church ministry, or the nexus of faith and culture. Full-time students typically complete the 120-credit program in four years. Need-based tuition assistance reduces costs by up to 50%. God’s Bible School offers an online ministry degree rooted in Wesleyan theology and biblical approaches to ministry: a bachelor's of arts in biblical and theological studies. Students encounter basic doctrines of Christian theology and prepare for careers as pastoral counselors, missionaries, and preachers. This 120-credit, four-year degree includes humanities classwork and advanced electives, such as approaches to urban ministry and critical issues in holiness. Committed to providing an inexpensive education for future ministers, God’s Bible School offers low tuition rates, along with payment plans, discounts for students with ministerial parents, financial incentives for on-time tuition repayment, and internal endowment and merit-based scholarships. Owned and operated by the Florida Baptist Convention, BCF offers degree programs online, at two satellite locations, and on the main campus in Graceville, Florida. Multiple online ministry degrees are available; students major in fields such as biblical studies, Christian education, and missions with a concentration in aviation. BCF’s bachelor's of arts programs provide foundational knowledge of biblical interpretation and Christian theology. Advanced seminars prepare students for future ministry careers; topics include biblical foundations of leadership, church business administration, and life on the mission field. Courses are offered asynchronously within traditional academic semesters. Online students partner with faculty to complete capstone projects that require extracurricular ministry experience. Applicants must have a GPA of 2.5 or higher, submit a statement of faith, and possess a recommendation from their local church. Piedmont International prepares students for Christian ministry through award-winning online education. Students earning a bachelor's of arts in Bible master biblical texts, events, and methods of interpretation. Online students may pursue a minor to prepare for specific ministry work. Online minors range from American Sign Language to management for nonprofits. The university is committed to providing affordable, flexible degrees, and students pursuing an online theology degree benefit from small class sizes and multiple program formats. Classes are taught in seven-week sessions, and applicants choose from six enrollment dates throughout the year. Piedmont International offers extensive financial aid options, along with scholarships and grants for candidates serving in or preparing for Christian ministry. Through intensive leadership training and deep biblical study, Johnson’s online bachelor’s degree in ministry leadership prepares students for careers in Christian ministry. The main campus, located outside Knoxville, Tennessee, provides students completing a theology degree online with 24/7 technology support, online academic advisement, and bi-weekly chapel services streamed online. In addition to Bible, theology, and leadership coursework, the program includes a capstone ministry internship. Students partner with a mentor in their local community to supplement theoretical studies with real-world ministry experience. Full-time students typically complete the 120 required credit hours in three years. Johnson University offers discounted tuition for online students. Founded in 1997, TKU in Los Angeles, California, is a leader in Pentecostal/Charismatic seminary education. Available entirely online, the bachelor's of biblical and theological studies provides distance learners with comprehensive exposure to scriptural analysis, Christian doctrine, and ministry techniques. The 124 required credit hours include biblical Greek and Hebrew. TKU’s online theology degree includes electives such as church history, messianic Jewish studies, advanced exegesis, and apologetics. The seven-week courses are offered during fall, spring, and summer semesters. Students taking the maximum of four online courses per semester can expect to graduate in four years. Online students pay the same tuition rate as on-campus students. Tailored to both future scholars and pastors, LBC’s bachelor's of arts in biblical studies blends rigorous biblical training with a focus on the day-to-day needs of ministers. This online theology degree requires classes such as spiritual life, evangelism, and cultural context of the New Testament. Degree minors, such as business administration and sports management, provide students with specialized knowledge to advance their careers. Of the 120 required credit hours, students must earn only 30 credits through LBC. Apart from transfer credits, students may earn degree credit for military service or life experience. Applicants to this fully online program must have a 2.0 GPA and pastoral recommendation. DeSales University offers a distinctly Catholic approach to theological education. 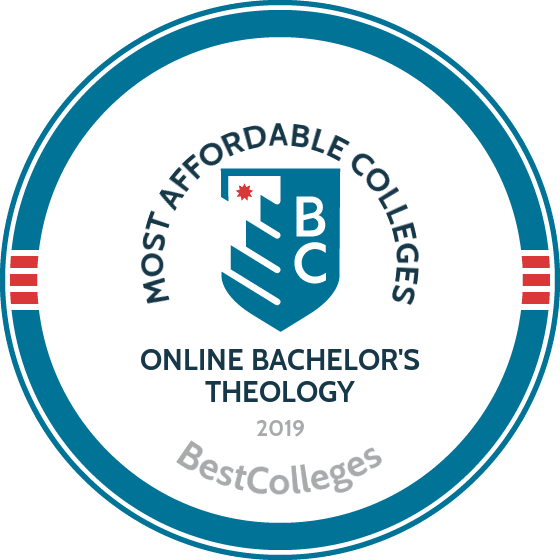 The bachelor's of arts in theology introduces students to religious philosophy, church history, and systematic theology, while integrating knowledge of church doctrines, contemporary theological issues, and ministerial concerns. The program prepares students for graduate theological work and careers across disciplines. Online courses are delivered synchronously and asynchronously, and the required 120 credit hours can be completed fully online or in a hybrid format, which involves some on-campus learning. Students may apply prior work experience or up to 75 transfer credits toward their online theology degree. With 11 enrollment dates throughout the year and affordable tuition, this is one of the most flexible programs available. For applicants with at least 60 credit hours from an accredited university, Indiana Wesleyan University in Marion, Indiana, offers an accelerated online ministry degree. The bachelor's of science in biblical studies, designed for students entering advanced ministry positions, meets ordination requirements of several denominations. The curriculum focuses on biblical interpretation from a Wesleyan-Arminian perspective and includes a comprehensive review of Christian scripture. Coursework covers key Christian doctrines, such as salvation and holiness, as well as Church history and Christianity in North America. Enrollment dates are offered throughout the academic year, and the core 60 credit hours can be completed asynchronously. Substantial discounts to the already affordable tuition are available to pastors, especially those with appointment in the Wesleyan Church. From its main campus in Roseville, Minnesota, the University of Northwestern offers online students the same small, Christian learning experience. Online students complete courses over traditional semester timelines and engage in real-time with peers and professors. The bachelor's of arts in biblical studies and theology includes fully online classes, as well as blended formats. Students complete 125 credit hours in the humanities and Christian theology, emphasizing advanced studies of interpretation methods and biblical Greek. This affordable online theology degree is deal for students pursuing careers in ministry or graduate seminary work. Financial aid and monthly payment plans are available for distance learners. Students with family at the university and full-time ministers receive additional tuition assistance. Manhattan Christian College’s bachelor's of science in biblical leadership is a degree-completion option for applicants with 40 completed credits. Transfer credits are applied to humanities general education requirements. Online learners begin by studying the Hebrew and Christian scriptures, then advance to curriculum integrating biblical studies with Christian leadership. Students study theories of leadership in conjunction with pastoral counseling, preaching, and administration. Graduates serve local churches, pursue global mission work, and apply management skills in diverse professional settings. The program offers two online start dates per academic semester, and most students take two classes per eight-week term. Online tuition is discounted heavily, making Manhattan Christian College an affordable option for students completing their theology degree online. Unlike other peer programs, the bachelor's of arts in Christian ministry at John Wesley University offers six concentrations, allowing students to train for a particular area of ministry, such as counseling, education, intercultural studies, worship arts, pastoral ministry, or youth and family ministry. The program requires 122 credit hours, and classes are delivered in eight-week sessions during the fall and spring semesters. John Wesleyan accepts transfer credits from accredited institutions, and online students typically complete their online theology degree in four years. On-campus students enjoy one of the lowest tuition rates among private North Carolina colleges, and online students receive an additional discount. MVNU’s bachelor's of arts in ministry is an accelerated and affordable online theology degree designed for applicants pursuing a second undergraduate degree. The core curriculum reviews concepts and theories of pastoral leadership; graduates are prepared to tackle practical ministerial tasks like budgeting, volunteer recruitment, and evangelism. Remote learners take courses synchronously with peers, promoting collaboration and creating a support network that lasts beyond graduation. While the degree can be completed fully online, students near Mount Vernon, Ohio, may take a combination of online and on-campus courses. Applicants must hold a baccalaureate degree from an accredited college and a minimum GPA of 3.0. Ecclesia College in Springdale, Arkansas, offers a fully online bachelor's of biblical studies. In addition to general education classes, the 120-credit degree includes training in exegetical methods and specific books of the Bible. The program integrates Christian ethics and theology with practicums in ministry, which remote learners complete in their own communities. Online students are welcome to participate in service-learning projects offered through the school, some of which involve travel and charitable work abroad. All courses are offered asynchronously, and start times are spaced throughout the year. Its low, per-credit tuition rate makes this one of the most affordable online theology degree programs available. Merit scholarships can further reduce expenses, and Arkansas residents can apply for additional funding. A growing, interdenominational university in Florida, PBA’s bachelor's of arts in ministry empowers students with biblical, theological, historical, and practical Christian knowledge. Requiring 120 credit hours, this online ministry degree builds on foundational studies of biblical texts, advanced exegesis, and theological training. Core classes include apologetics, evangelism, missions, and the nexus of church and society, and students may specialize in specific avenues of ministry. Classes are offered every six weeks, and while most allow students to study independently, two synchronous courses are required. Applicants must complete a writing assessment and submit any prior transcripts. Transfer credits are accepted, and PBA also offers streamlined master’s degree options. Offered completely online, the bachelor's of science in leadership and ministry at Central Baptist College is an economical and rigorous online ministry degree. Foundational classes introduce learners to principles of the Christian faith and review the Old and New Testament texts. Advanced electives, such as biblical archeology and modern cults, allow students to explore global faith. Graduates serve as ministers, sometimes bi-vocationally, applying their studies to other disciplines. Online coursework is delivered asynchronously. Classes typically last five weeks, though longer formats are occasionally available. Most students complete the 120 required credits in four years. Applicants should apply through Central Baptist for need-based or merit-based assistance. Students of diverse faith backgrounds will find Saint Joseph’s bachelor's of arts in theological studies to be academically challenging and spiritually rewarding. Based in Standish, Maine, Saint Joseph’s accredited, 128-credit online theology degree is taught by highly trained faculty. Coursework includes systematic theology, Catholic doctrine, liturgy, and biblical studies. Advanced theological courses cover spirituality, ecumenism, and moral theology. Remote learners complete courses with a cohort of peers, and classes are available throughout the year. Graduates work in ministry, business, education, and international aid. Online students may also take advantage of Saint Joseph’s fast-track program to advance toward a master’s degree. Financial aid is available for those taking courses on at least a half-time basis. The first Nazarene institution to offer higher education degrees online, NBC’s convenient and affordable online theology degrees include a bachelor's of arts in ministry. The customizable program offers eight majors—such as leadership and ethics, Christian school education, and counseling for Christian ministries—and four minors. Each major requires core Bible and theology classes. Online classes are delivered asynchronously, and NBC allows up to 75% degree completion through transfer credits. The 120-credit program features an active online student body and personalized academic support. Applying is free and does not require recommendations or writing samples. NBC is regionally and nationally accredited and offers need-based and merit-based scholarships. Requirements for online and campus-based religion degrees vary widely across institutions, but most programs offer coursework in biblical studies, theological history, and principles of ministry. Some feature specialized courses in areas such as pastoral counseling, youth ministry, and interracial and gender-inclusive faith communities. This section provides an idea of what to expect from a bachelor's program in the religion field. This concentration provides knowledge and applications needed to serve faith communities. Coursework might include nonprofit business principles, best practices in ministry administration, church governance, homiletics and expository preaching, church planting, and revival strategies. Some programs emphasize the development of interpersonal skills for the creation of inclusive ministries, addressing gender, race, youth, disabilities, and other special needs. Students in this concentration learn counseling techniques and mental health training to provide psychological therapy, emotional support, and spiritual guidance to individuals in a variety of settings, from church congregations to religious-affiliated agencies. Most pastoral ministers have a bachelor's in theology, and many continue their education at the master's level in psychology or counseling and obtain state licensure. A concentration in religious education prepares students to design and administer church education programs for adults and children, plus religion curriculum used in elementary through high school levels in church-sponsored schools. Coursework focuses on biblical, catechetical, and other types of instruction aligned with the beliefs of a particular faith or denomination. Each school imposes its own religion degree requirements, which reflect the specific tenants of the faith-based institution and its program goals. In general, programs consist of foundational core courses, followed by major requirements and electives (like those listed below) in areas such as biblical studies, church history, theological ethics, ministry leadership, and pastoral counseling. A gateway class for undergraduates in the major, this course presents an overview of the message and context of the canonical books of the Old and New Testaments. Students acquire biblical hermeneutics skills and learn to analyze biblical language and text, synthesize biblical knowledge, and integrate principles into contemporary applications. This course provides historical and theological training for future church leaders, ministers, and educators. It explores the history of Christianity and the church both in the United States and globally, with a special emphasis on non-Western traditions. Students examine various theological developments and major social movements that have shaped the church over time. This introductory course, designed for students interested in ministry roles or who intend to pursue graduate work, presents the basic ideas of apologetics, the relationship between reason and faith, the apologetic method, major world views, and challenges to Christian faith. Themes include religious pluralism, atheism, biblical inaccuracy, and postmodern perspectives on religion. Students in this course learn about the responsibilities and challenges in contemporary church ministry. They analyze leadership principles, administrative procedures, organizational and managerial practices, counseling, and ethics. Course content addresses practical considerations such as the management of staff, volunteers, and finances, and the upkeep of buildings and grounds along with the worship and pastoral needs of congregants. Students integrate and apply theological and psychological principles of pastoral counseling and care, using case studies in several areas including bereavement support, marriage and family counseling, and ministries designed for youth and other special populations. This course appeals to students seeking positions in pastoral ministry and provides the academic foundation for graduate studies and licensure in counseling. How Long Does It Take to Get an Online Bachelor's in Theology? Online undergraduate theology degrees offer a manageable alternative to traditional campus-based programs. Most programs require approximately 120 credits; students who enroll full-time complete the degree in four years or less. Some schools offer accelerated programs, which take two years or less to finish with continuous full-time enrollment. Online students, who often have to juggle work or family responsibilities, sometimes choose to take one or two classes per term, lengthening how long it takes to complete the degree. Before enrolling in any online program, consider its course delivery format and how course delivery may affect degree length. Many schools offer self-paced, asynchronous courses, which give students flexibility to progress through the program at their own speed. Some schools use cohort-learning models, which place each new class of students into groups. These cohorts take all their courses together at fixed times in sequence through the program. What Kinds of Schools Offer an Online Bachelor's in Theology? Christian colleges generally adhere to a Christian orientation, employing faculty who espouse a Christian worldview. They offer a variety of undergraduate liberal arts and sciences programs similar to those offered in secular schools, along with religious studies courses. Whether nondenominational or church-sponsored, these schools attract students who prefer environments that promote Christian values. In contrast to Christian colleges, Bible colleges feature a narrower focus of undergraduate degrees with significant emphases on biblical studies and theology. They offer undergraduate education in areas like Bible studies, pastoral ministry, and Christian education, sometimes along with other academic and professional majors. Students seeking online biblical studies degrees at Bible colleges usually intend to enter the ministry, do missionary work, or assume other church leadership roles, though some graduates opt for nonreligious careers. Many Bible colleges receive accreditation from the Association for Biblical Higher Education, along with regional or national accreditation. Seminaries receive sponsorship from a parent denomination and offer bachelor's, master's and doctoral degrees in religious studies and theology. Students enrolled in online seminary schools intend to fill leadership and educational positions with denomination-affiliated institutions. Many seminary schools receive accreditation from agencies affiliated with the U.S. Department of Education. How Much Does an Online Bachelor's in Theology Cost? The cost of earning a religion degree online differs considerably by school. Tuition ranges from just over $10,000 annually to almost $80,000, with wide variations between public institutions and private schools. Most schools charge higher tuition rates for out-of-state students, though some online programs offer flat tuition rates for all students regardless of state residency. Some programs provide discounted tuition for students who take full course loads each term. Students should always consider "hidden costs" in addition to tuition; online programs often charge technology fees that do not apply to on-campus students. Some programs require students to travel to campus a few times each year for workshops. Accredited schools undergo an extensive evaluation of academic standards and financial practices by an outside agency recognized by the U.S. Department of Education (ED) or the Council for Higher Education Accreditation (CHEA). Most colleges seek out either national or regional accreditation. Technical, vocational, and for-profit schools usually acquire national accreditation, and often offer less rigorous admissions requirements and relatively inexpensive tuition. Regional accreditation, the most popular and prestigious designation, requires higher professional and academic standards. A school's accreditation status determines credit transferability and eligibility for federal financial aid. Many schools offering theology-related degrees hold regional accreditation, and some seek out additional specialized accreditation for their specific programs. For example, Bible schools may acquire programmatic accreditation from the Association of Biblical Higher Education. Seminary schools offering graduate programs usually seek accreditation from the Association of Theological Schools. Two major organizations oversee the accreditation review process for U.S. colleges and universities. The ED establishes national educational policy and administers federal financial aid programs. CHEA coordinates postsecondary accreditation and advocates for the self-regulation of 3,000 member institutions. Both regional and national accreditation associations, plus some programmatic accreditors, receive approval from the ED or CHEA to ensure they adhere to standard regulatory criteria. The accreditation review considers several variables, including curriculum quality, faculty reputation, student services, and financial stability. Students considering any online religion or theology degree should always confirm a school's accreditation status by checking the ED and CHEA websites. An online undergraduate theology degree leads to many career paths in ministry, church leadership, and other service and administrative roles. Salary ranges vary by geographical location, size of the employing organization, and specific job requirements, with the highest salaries reserved for those with the most experience. While graduates of religious studies or theology programs often seek positions in church ministry, others may choose to serve as chaplains in settings like hospitals or the military. Many graduates enter administrative occupations, overseeing development and programming for churches and social agencies. This table illustrates expected salaries by experience level for various ministry and supervisory roles. An online theology degree enables students to connect their religious values to a surprisingly wide array of careers. In addition to the most common employment paths in church leadership and ministry, graduates may pursue vocational and professional interests in nonprofit, nondenominational, and secular settings as pastoral counselors, chaplains, educators, and administrators. A bachelor's also serves as a stepping stone to advanced graduate-level study and licensure in counseling or other helping professions. Chaplains offer appropriate spiritual guidance, emotional support, and counseling to patients, families, and caregivers as requested. Large hospitals often employ several chaplains representing multiple religious faiths. Most chaplains hold at least a bachelor's degree in theology or divinity studies, and previously served in a clerical role or as a counselor. Clergy are individuals who conduct worship services and perform spiritual functions related to the beliefs and practices of a religious faith. Clergy lead congregations, preside over services, direct educational programs and other activities, and provide guidance and support. Many religious organizations require clergy members to have earned at least a bachelor's degree in ministry or a theology-related field. These faith-based mental health professionals integrate religious beliefs into therapy and counseling applications. They assist individuals dealing with personal challenges, including depression, substance abuse, mental illness, and behavioral disorders. Prospective pastoral counselors usually obtain a bachelor's degree in theology or a related field before pursuing licensing and further graduate training in psychology, counseling, or pastoral care. Responsibilities for religious directors include the design and implementation of religious-based programming. Religious organizations often prefer to employ directors with a bachelor's degree in ministry, Bible studies, or a related area, plus experience working with diverse groups. These pastors administer youth ministries within a religious organization or church-affiliated social agency, conducting programs for young people from preschool through college. They counsel, conduct meetings and study groups, and engage young people in community outreach and mission work. Many youth pastors hold at least a bachelor's degree, and some hold counseling licensure. Anyone planning to enroll in a bachelor's program, whether campus-based or online, should complete and file the Free Application for Federal Student Aid (FAFSA) to learn more about grants, low-interest loans, and other sources of government funding. In addition to federal, state and college-specific financial aid, many faith-based organizations and nonprofit foundations offer scholarships and grants specifically geared toward students pursuing religion-related college degrees or careers in ministry or community service. Online college programs offer a flexible, affordable option to single parents interested in earning a degree and securing their family's financial future. We've compiled a list of scholarships, grants, and other financial aid options geared toward single moms and dads.